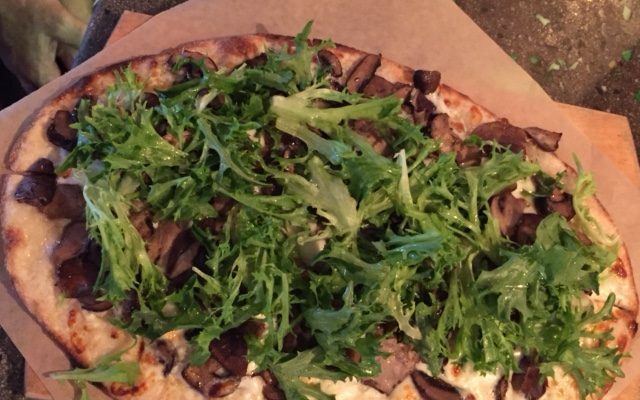 This delicious flatbread can be served as a side or entree paired with a salad. You can be super creative with the toppings and add whatever you have in the fridge such as sautéed or grilled vegetables, any type of cheese that melts, sautéed onions, pesto or fresh herbs. The dough can be made ahead and frozen for an easy make ahead dish when friends stop by. 1. In bowl of an electric mixer fitted with paddle attachment, stir together water, yeast, and sugar until dissolved, about 5 seconds. Let stand until foamy, about 5 minutes. In large bowl, whisk together flour and salt. Add to yeast mixture and mix on low speed until just combined, about 30 seconds. Add oil and mix on low speed until just combined, about 30 seconds. Switch to dough hook and mix on medium speed until dough is elastic and pulls away from sides, about 8 minutes. 2. Lightly oil a large bowl. Gently shape dough into a ball and transfer to the bowl. Turn over several times to coat lightly with oil, then cover with plastic wrap and let rise in warm place until doubled in size, about 1 hour. While dough is rising, position rack near bottom of oven and top with pizza stone or heavy baking sheet. Preheat oven to 450°F. 3. Punch down dough and divide into 6 pieces. Roll out on a lightly floured surface into a thin rectangle 12 by 4 inches. Transfer the dough to a baking sheet and lightly dust with flour. Repeat with remaining dough separating each one with parchment. 4. Transfer 1 or more flatbreads to the preheated pizza stone and bake in batches until slightly puffed and lightly brown about 8 minutes. Transfer to a wire rack to cool completely. Leave the oven on. 5. Heat a medium skillet over medium high heat and add a tablespoon of the olive oil. Add the onions and thyme and sauté for about 3 to 4 minutes. Lower the heat to medium and cook stirring occasionally until caramelized, about 10 to 15 minutes. Season with salt, pepper and sugar and add ¼ cup of water, scrape up all the brown bits into the onions and cook another 5 minutes. Set aside. Add a tablespoon of olive oil to the skillet and sauté the mushrooms until all the water has evaporated, seasoning with salt and pepper. 6. Brush each flatbread with olive oil and spoon the onions and mushrooms over the top. Sprinkle the cheese over each one and season with salt. 7. Transfer to the hot oven and bake for 6 to 8 minutes until golden brown and cheese is melted. Scatter arugula on top and cut into squares or rectangles, serve immediately.